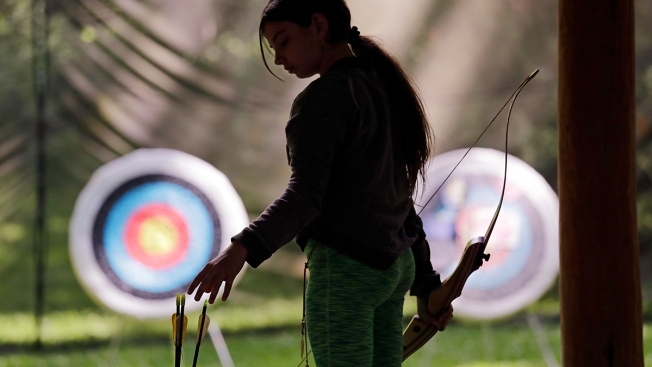 Ket Davis reaches for an arrow during an archery session at a Girl Scout day camp in Carnation, Wash., on Tuesday, June 26, 2018. As American women seek a larger role in politics, fairer wages and an end to sexual harassment, the Girl Scouts see an opportune time to show some swagger in promoting their core mission: girl empowerment. But the marketing campaign is about more than boasting. It's also an effort to confront several high-stakes challenges, including reversing a long slide in membership, making the case for all-girl scouting after the rival Boy Scouts included girls and updating the organization's curriculum for a new generation that expects more than cookies and camping. "What's happening in society as a whole makes it all the more important for girls to have every possible opportunity to learn that their voice and opinion matter, and to have the courage and confidence to become who they want to be," said Megan Ferland, CEO of the Seattle-based Girl Scouts of Western Washington. One major challenge, she said, is to puncture some of the myths and stereotypes that affect public perceptions. "People hear 'Girl Scouts' and think, 'Oh, those cute little girls that sell the cookies and make macaroni necklaces' and that's it," Ferland said. "It is so much more than that." She cited activities such as robotics and rock climbing, a strong emphasis on community service and the iconic cookie sales, which she depicted in a recent newspaper essay as "the largest girl-run business in the world." 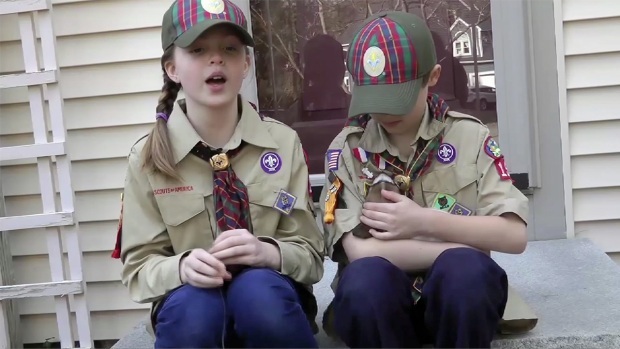 Thousands of girls have become Cub Scouts in an early adopter program as the Boy Scouts of America begins welcoming girls into the organization in new ways. The Boy Scouts decided last year to admit girls into all programs. But the Girl Scouts' parent organization, Girl Scouts of the USA, will not follow suit by admitting boys. "I believe with full conviction that Girl Scouts is the best leadership organization in the world for girls, and that is because we are girl-led and girl-centric," said Violet Apple, CEO of Girl Scouts of Central Maryland. The Girl Scouts and Boy Scouts, as well as other youth organizations and sports leagues, have experienced membership declines in recent years, for reasons ranging from busy family schedules to the lure of online games and social media. The Girl Scouts say they now have about 1.76 million girls and 780,000 adult members — down from about 2.9 million girls and 900,000 adult volunteers in 2003. Some recruitment efforts reflect the Girl Scouts' pride in the diversity of their membership. For example, the organization over the past two years has created more than 240 new troops in low-income Los Angeles neighborhoods to serve several thousand girls from Hispanic, African-American, Korean and other communities. Denise Nowack, who oversees the recruitment programs, said the Girl Scouts council in LA decided to cover basic first-year costs for the new troops, including membership fees and uniforms, to ease the financial burden. Many other councils struggle to find enough adults to serve as volunteer troop leaders, leaving hundreds of girls on waiting lists. "It's really sad," said Asha Menon, a troop leader for seven years in the Atlanta suburb of McDonough. "All these parents show up with kids who want to be in it — but they want another adult to take the lead." In Chicago, TV producer Craig Harris has tried — with minimal success — to persuade other men to join him as Girl Scout leaders. Harris started as a volunteer 14 years ago when his eldest daughter — now a confident college student — joined the Girl Scouts as a shy 5-year-old. Harris' 11-year-old daughter is active in the Girl Scouts, pursuing her interest in science. "I lead a full career, but I've found ample time to be a volunteer," Harris said. "My oldest daughter went all the way through, and I was there at every stage. It was invaluable time building those memories with her." Among the many mothers juggling work and Girl Scout duties is Audra Fordin, owner of an auto-repair business in New York City's Flushing neighborhood. She is founder of an education initiative called Women Auto Know and leader of her teenage daughter's troop. Fordin is confident the Girl Scouts can maintain their stature as an all-girl institution even as the Boy Scouts go coed. "Some girls may not feel as capable of doing the same things boys can do," she said. "But when we come together in a group, we can accomplish whatever we want to do." Jimmy Fallon and JCPenney partner up to surprise Giselle Burgess, founder of Girl Scout Troop 6000 for homeless kids in New York City, with a $50,000 donation. Reeny Boutros, 18, of Wichita, Kansas, started Girl Scouts at age 5. She said the experience helped her develop the skills and confidence that recently earned her admission to Stanford University, with plans to major in computer science. Boutros has received Girl Scouting's highest honors — first earning the elite Gold Award, then being selected as one of 10 National Young Women of Distinction. She's a technology whiz now, but recalled struggling with studies back in middle school. 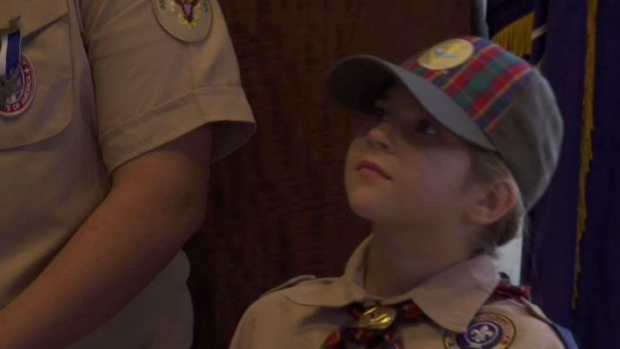 "The badge work (with Girl Scouts) was one of the few academic recognitions I got," she said. "I got exposed to archaeology, photography. It was a great way to boost my self-esteem." Boutros' experience reflects the Girl Scouts' push to engage girls in science, technology, engineering and math. There are a host of new STEM-related badges, and there's a newly opened year-round camp in Dallas — the STEM Center of Excellence — that will offer K-12 STEM programs on a 92-acre campus. But the best part of being a Girl Scout? "It's always been camping," she said. "You put your phones away and bond with nature — and just giggle uncontrollably with your friends."